This entry was posted in Attitude, Random, Relationships, Work/careers and tagged extravert, Facebook, introvert, quiet, shy. Bookmark the permalink. Yes! We do live an extraverted world at the moment. The thing I have found is social media has made it easier for me to ‘engage’ with others, without having to put myself out there, so to speak. My husband is an extravert, and it is quite the balance meeting his needs as an extravert and mine as an introvert. Though he wishes I was there at every social engagement, he now knows that I need time alone at home just as much as he needs time out with friends. Thanks for commenting, Giorge! 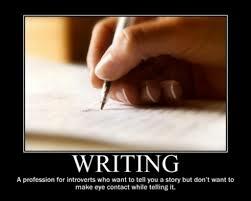 I think the world will probably always be run by extraverts, just because they tend to band together more. 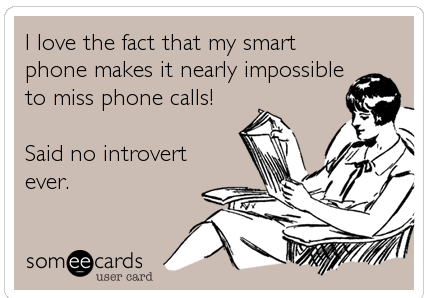 😉 But I think there’s more awareness of various styles than they used to be–which makes life a bit easier for the introverts…At my previous workplace we actually had our Myers-Briggs ratings (which include Introvert/Extravert) printed on our nameplates by our cubes/offices. Although many people don’t like to be pigeonholed, I actually found it kind of helpful in terms of understanding how to deal with others.